Will iPhone 6 cases fit the thicker iPhone 6s? Having a smartphone as popular as Apple's iPhone has its benefits. One of them is that the selection of accessories designed specifically for your device is plentiful – there are tons of speakers, docks, spare cables, and, of course, protective cases to pick from. And now that the iPhone 6s and iPhone 6s Plus are official, millions of new cases are expected to fly off the shelves. Those upgrading from an iPhone 6 to an iPhone 6s, however, won't be needing a new case. They can simply take their old iPhone's case and slap it onto their new phone. Or can they? You see, giving a definite answer to this question is trickier than it seems. On one hand, we have the iPhone 6s and the iPhone 6s Plus, which are thicker, wider, and taller than their predecessors. The difference is minute, and seeing it in the size comparison images below is impossible, but it is definitely there, as the figures below each image indicate. On the other hand, the difference in size between the new and the old iPhone models might be too small to matter. The biggest increase is in thickness – both the iPhone 6s and the iPhone 6s Plus are a hundredth of an inch thicker (that's about 0.2 mm) than their predecessors. And that's a very tiny, almost negligible difference. In fact, Apple's official leather and silicone cases are listed as compatible with both this and last year's iPhone variants. That's great news! 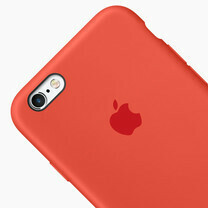 Still, there are hundreds of different iPhone cases on the market, all with their unique proportions and materials. Some of the ones designed for the iPhone 6 could be way too tight to fit the iPhone 6s or might not wrap around it as snugly as they should. That's one thing you should keep in mind if you intend on fitting your iPhone 6s or iPhone 6s Plus inside a case when you get it. They still have the same dimensions. It'll be fine. The difference is only 0.2mm and most cases will fit. LUVVITT Ultra Armor Case fits both iPhones. That minimal size difference will be fine with just about every case. There's usually a little extra room in each case anyway. Does ANYONE actually move an old beat up case to a new phone? I don't know of a single instance of someone I know doing that. A low cost Iphone case is available in Amazon. I have been using it for 2years. It is perfectly fit for Iphone 6 plus cover and easy access of all the phone device. This ultra thin flip case specially designed for Apple Iphone 6plus. LOL，you really gave us practical discussion between the iPhone 6s case and iPhone 6 case,I‘m one of those accustomed to looking for really pretty case for protecting and making the phone unique and i found a shop with huge collections of great variety of iPhone 6 cases from onu-mall,I thought the case are so much more and cheaper than other shops online,would you give me a favor to give me some suggestions,I wonder what's your opinion,appreciated to your prompt recommendation.